There’s nothing 6 year olds or older kids love more than being in the outdoors. Camping is an outdoor recreational activity involving spending one or more nights in a tent, a primitive structure, a travel trailer or recreational vehicle at a campsite with the purpose of getting away from civilization and enjoying nature. National parks and other publicly owned natural areas are popular venues for camping. Camping is often restricted by law to designated sites in order to prevent campers from damaging the environment. 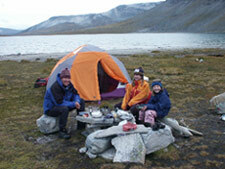 You can use camping to teach the kids independence and self-sufficiency. Survivalist campers set off with little more than their boots on the roughest of trails—the idea being to really gut it out. However, you might prefer to set up a tent within a few hundred feet of a campsite. This can serve as base camp from where you can set out on nature hikes, which include fishing and swimming. Camping usually is a breeze with kids this age. They can help set up the tent and unload the car and can be trusted to remain nearby without continual supervision. One thing though—every child must have their own flashlight! Everyone loves making cool shadows on the tent walls and all hell breaks loose if sharing is required. Kids enjoy looking at the different kinds of insects that they can find. They might even catch frogs and minnows near the lakes and streams. You could let them examine these creatures and return them unharmed to the wild. Also, carry bug jars, nets, and buckets. Hiking with six to eight year olds is generally a comedy of errors. Buy some of those disposable cameras or provide your kids with cheap cameras at the start of a hike. The novelty of being able to carry their own cameras will get you through your travels that day. Get the photos developed at a one-hour place if possible while you are still traveling – and then make a huge deal about their incredible pictures. Alternatively, you could provide them with some of the latest digital cameras that give an instant printout—however, you better be a “richdad” if you decide to make this choice. The next time you hike, the kids will be eager as long as you provide them with enough batteries and enough film or digital storage media! Pick a theme for the trips. It helps you organize activities around a central concept. Much easier! Some favorites are “Western” including a chuck wagon meal, corn bread muffins and tea. You could come up with 20 ways to use a bandana around camp and practice tying knots with one-foot sections of rope. At night, you could have a small campfire with twigs and sing old western cowboy songs, try some cowboy poetry and learn a little about the stars. The “Survivor” theme is another hit, focusing on back-to-the-basics camping essentials. Children this age can grate cheese, stir a cooking pot, fetch water, hand wash and hang laundry, clean up around camp and even pitch the tents with a little help. They love to hike (1 to 2 miles) with frequent breaks. Be sure to take along a trail mix snack the kids can make themselves. You could even make it a bit of a competition. Kids love competitions. “Explorer” themes like Lewis and Clark are great for this age group, too. They naturally love to explore. Take along magnifying glasses, containers, nets and plastic cups to catch and examine insects. Set a firm, no touching policy for reptiles, insects and plants until they’ve been identified—this saves a lot of worry. Use handbooks to make an identification. Always involve the kids in the basics of the camp. If the adults do all the preparing, cooking, and cleaning, the kids don’t learn. The look on children’s faces is priceless when they’ve made their first wood campfire or pitched their first tent. The best advice is plan with the kids, but always leave plenty of room for running, swimming, biking or just kicking around a ball. Kids love to comb beaches, draw in the dirt and gather rocks. Always have paper and crayons handy, cards are good, too – but don’t worry about entertaining the kids 24×7. Camping is all about learning to entertain yourself without TV and games. Throw in a book or favorite magazine for yourself, and use your imagination to fill in the rest. If the kids behave well, reinforce their behavior with a prize. The prizes can be simple little things usually picked up at the local five and dime store…i.e. bubbles, a comic book, a toy car, a box of crackerjacks…etc. You could also shop for your prizes online. Wrap the prizes to make it even more exciting. Gift wrapping material is available in an assortment of colors. With the short attention spans kids have, the new prize will tide them over ’til the next stop. The camp journal. Take plain white paper – about 5 sheets per kid. Get you kids to fold the pile in half and hold it together with a paper clip. Get them to color the front cover and title it My Camp Journal. Kids are very proud of their journal. If there are some kids who can’t read or write yet, tell them to do pictures instead of writing in them. They will have a nice memory of their first trip. Bring cards. You can play many games with a simple deck of cards. They can even be a deck that is missing cards. Young kids don’t know/care. Go fish, and war, and let the kids explore their wild side under controlled conditions. Pack lots of socks for each child—at least two pairs or more per day. If there is a drop of water, or mud puddle of any kind to be found, they will find it! Don’t expect the socks to come clean even with the best of detergents. If you have an FRS (family radio service walkie talkies), one of the neat things you and your kids could do, is a game of high tech hide-and-seek of sorts… they can hide out, and you have to find them (providing they can see you when they hide, for safety’s sake)… and vice versa… lots of fun, and you can use the walkie talkies all the time, in stores when you go shopping and she is with her stepmother, or other times. A walkie talkie is a wonderful little gadget for kids! For bedtime take the illuminated “glow” sticks (the kind in the foil cover that you break and shake) to use for night lights. Just use your imagination and remember what it was like to be a kid… ideas of things, little things you can do to make anything more fun will fill your mind almost instantly! One last thing, when talking with a kid about anything serious, get down to their level! Squat down or get them up on something high so they can see eye to eye with you and not feel intimidated… hug your kid, and be thankful everyday for the blessing they truly are… they can be a challenge, but they are there for you too… remember that.